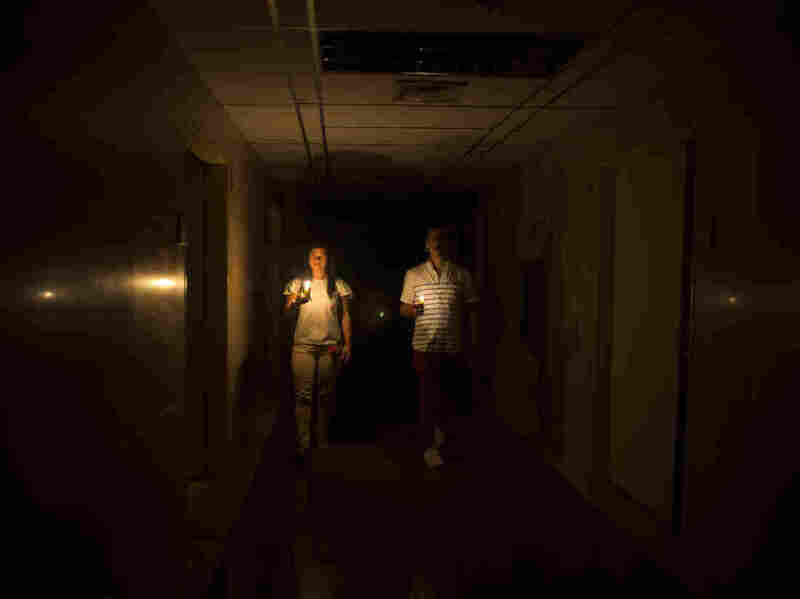 Amid a widespread power outage in Venezuela on Thursday, relatives of a patient walk in the dark halls of a health clinic in Caracas. President Nicolás Maduro was quick to blame the “electricity war” on the United States, which has supported Venezuela’s opposition leader Juan Guaidó after he declared himself interim president in January and received endorsements from dozens of countries. Minister of Communication and Information Jorge Rodríguez described the outage as an attack on Venezuela’s electric system — “a criminal action” driven by Sen. Marco Rubio (R-Fla.), who has been an outspoken critic of Maduro. Guaidó said that 22 states were without electricity for hours, breaking a record for Caracas. “Chaos, concern and indignation,” he said. Pompeo’s remark follows a humanitarian operation that went awry in February. Truckloads of food and medicine were turned away at the border and Maduro’s government celebrated it as a victory against regime change. Over the years, food and medicine shortages have sent millions of citizens fleeing for a better life. Hyperinflation is estimated to hit 10 million percent in 2019, according to the International Monetary Fund, and sanctions imposed by the Trump administration are likely to increase the country’s economic plight. Electricity shortages are not uncommon in the once rich country. Despite having vast oil reserves, the government exports its oil and Venezuelans rely on hydropower for their energy. Years of scant investment in hydroelectric infrastructure, combined with drought, have crippled the energy grid. A decade after the nationalization of the energy sector in 2007, the government started switching off the power grid in cities and towns across the country. Because of the rolling blackouts, Venezuelans have seen their food decompose, their appliances ruined and even their health care suffer, with doctors saying they sometimes perform surgeries under the light of mobile phones. Last year, one outage resulted in the deaths of three people, including a newborn. On Thursday, nurses at a wealthy Caracas health clinic held candles to monitor the vital signs of premature babies because backup generators had shut off, The Associated Press reported. Maduro ordered schools, businesses and government entities to shutter while crews tried to restore power.